After the uploader this is may be the second most used feature on Imageshack.com. 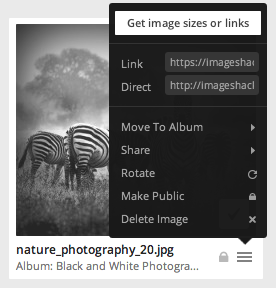 When you want to share an image link this is where you choose the link type and size. From the image menu bar select "get image sizes or links" at the very top. You will then see the window below pop up in your browser. There are a few options for TYPE of links available. These include Direct, Forum, Alt Forum and HTML. The image size can be set to "full size", in which case it will be the same size as the original uploaded image. You can also select a different image size to create a link with a dynamically generated image size that matches your chosen selection. 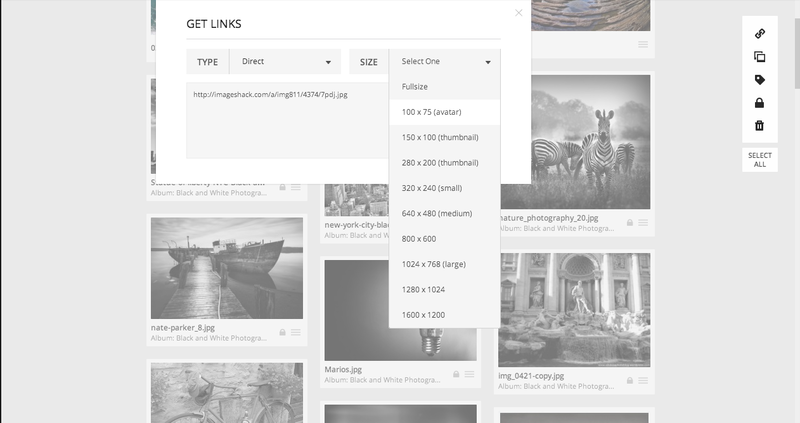 Direct links and some sizing options are only accessible to paid subscribed ImageShack users.